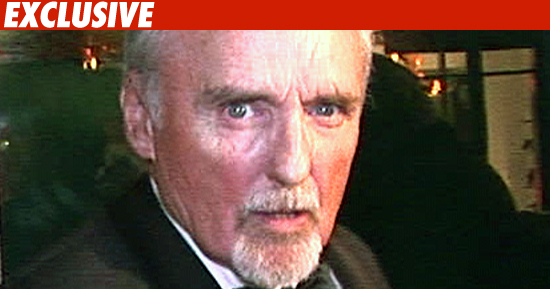 Dennis Hopper may have died peacefully, but TMZ has learned a war is about to erupt over his estate -- partially because Dennis died a married man. Dennis had been desperately trying to divorce Victoria Hopper -- he filed in January -- but the clock ticked too quickly, and the divorce was not final when he died this morning. Why the race to split up? Under the prenup, Victoria gets 25% of Dennis' fortune and a $250,000 life insurance payout -- but only if they were married and living together when Dennis died. That 'living together' part is critical because Victoria has been living in a separate house, on the same property as Dennis. Sources tell us Victoria will argue that since she was on the property, she was living with Dennis -- and is therefore entitled to the big payout. Dennis' high powered attorney Joe Mannis isn't surprised, saying "She said she would challenge it, and I fully expect her to do so." The divorce action is officially over now and this all moves to probate court -- where both sides say they're gonna fight. Get ready for a battle royal. Dennis Hopper CELEBRITY JUSTICE ™ R.I.P.